Spending five hours on an 18-hole course can take its toll on your feet, which can have a negative impact on your golfing game; something no golfer wants to hear! If you are currently exhibiting foot-related pain during or after golfing there could be many different causes. Biomechanical: Biomechanical related issues such as over-pronation (rolling the foot in) or supinating (rolling the foot out) could be impacting how you position yourself on the golf course. If you are not standing in a neutral position, the tendons and ligaments in your legs are being overused and strained. This can result in pain and discomfort. Heel Pain (Plantar fasciitis): Pain in the heel or pain in the arch often indicates inflammation of the long band of tissue under the foot (the plantar fascia). It can cause sharp pain and discomfort in either the mid-arch region or at the inside heel, and less commonly the outside heel. It is a common injury with golfers as they spend long periods of time on their feet. Achilles Tendonitis: Strain from overstretching, partial and even full thickness rupture of the Achilles tendon is a common golfing injury. 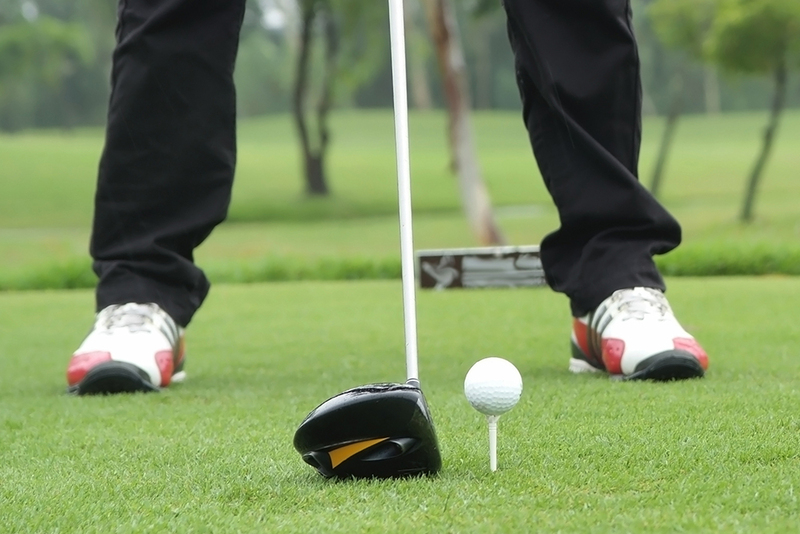 Your feet are under excessive pressure during the golf swing. This causes inflammation in the tendon and pain. Mortons Neuroma: Mortons Neuroma (or Interdigital Perineurial Fibrosis) is a common painful condition involving compression of nerves between the long bones of the forefoot just before they enter the toes. This condition can be caused by wearing ill-fitting golf shoes for prolonged periods of time. Big Toe Arthritis (Hallux Rigidus): Hallux Rigidus is a type of degenerative arthritis which is caused by repeatedly overextending the big toe during the golf swing. This motion causes stress and pain on the big toe and limits golfers ability to play. Golfing shoes: Choosing the correct golf shoes for your feet will provide comfort and functionality on the golf course. The perfect fitting shoes and a strong golf club to match will provide durability and stability for a neutral position. Advanced technology means golfing shoes are lighter and functionally improved to accommodate walking through the course. Custom Golf Shoes: Many golfers choose to use their favourite trainers on the golf course after having them customized into comfortable golf spikes by our pedorthic team. This is done routinely for comfort on the links but also for style, fitting issues and for injury management. At my FootDr, we can modify just about any shoe, converting them with industry leading Champ Stinger spikes. For the golfer that wants the very best, we can build fully custom-made golf shoes from scratch. Choose from classic leather or cushioned man-made soles and design them yourself with your very own choice of leather texture and colour and upper design. We can also customize all shoes with your initials or logo for that distinguished look. Orthotics: Custom-made orthotics for your golf shoes will improve posture and stabilize your feet. Orthotics support and correct body posture and assist with pronation control. If you already have daily use orthotics, you can transfer them into your golfing shoes or invest in a second pair made for your golf shoes if you are a regular on the course. Injury Rehabilitation: Being told to rest can be frustrating, but it important to allow foot, leg and hip injuries to heel. Foot related injuries which are left untreated can cause and aggravate existing conditions such as plantar fasciitis, corns and callus. By allowing adequate healing time, your feet will strengthen. My FootDr Podiatrists provide suitable shoe and orthotic recommendations to golfers who spend any period on their feet.